Reality is Broken | Himmel Attack! 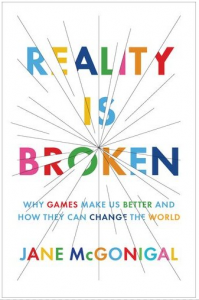 I finished reading “Reality Is Broken” by Jane McGonigal. It’s a pretty long book (370 pages), but very well written. I highly recommend reading at lest the first few chapters. The author explains how playing games is essentially doing “work” for our brains and bodies, and how, quite logically, humans have evolved to enjoy doing work. But the activities that we consider games are tweaked in such a way that this work is enjoyable- having clear goals, difficult but not impossible obstacles, rich feedback on our progress, and “fun failure” (I would also add pleasurable surprises to this list). She then gives examples of how we can turn what normally is considered “work” into a game experience. This is very close to what is considered “gamification”, but not in the shallow sense of the points and badges to which this term often refers. Near the end of the book (chapter 10), she brings in theories of happiness from the positive psychology movement. She believes that psychologists already know what makes people happy (making a positive impact on the world, valuing others and being valued by them, feeling productive and in control, etc.) but that despite the backlog of self-help books, people have trouble making themselves behave in ways that lead to their happiness. 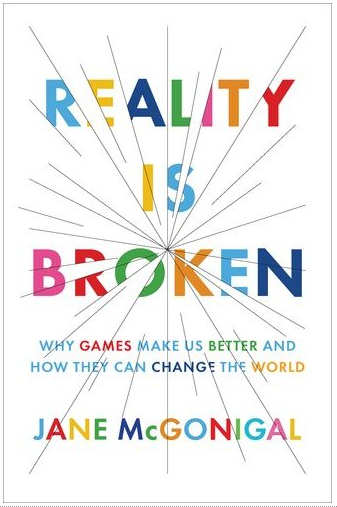 And so she designed games that are expressly made to make people happy in ways that align with positive psychology theories. The most curious one takes place in a graveyard. Apparently, thinking about death is supposed to make us happy, by making us more appreciative of our health and opportunities, as well as more forgiving of the “small stuff” that annoys us. It seems that graveyards used to be spaces for events outside of funerals, but now most graves are only visited 2 times after the funeral, if ever at all. And so she made a game called Tombstone Hold’em to make players reflect on death and have fun doing it. This entry was posted in Games by jesse. Bookmark the permalink.